At Splashbacks of Distinction we are passionate about glass! We don't just manufacture, supply and fit the highest quality kitchen splashbacks, we cater for clients who want to something a little different from the old fashioned wooden stair spindles. A beautiful toughened glass balustrade could well be the best decision you make. They will open out your living space and be a breeze to keep clean. Whether you want a glass balustrade for the home, the office, or as a safe and attractive surround to your garden swimming pool, few things are as safe and as pleasing to behold as a glass balustrade. The beauty of our toughened glass will look amazing with metal, or wood to create a very sophisticated, safe, and secure look for your exterior or interior areas. Splashbacks of Distinction always deliver exceptionally high quality glass balustrade systems for clients who desire a thoroughly modern look. Whether you are a home owner that wants an ultra modern, clean looking alternative to wooden spindles, or a business owner looking for an impressive looking balustrade installation, Splashbacks of Distinction are only a phone call away. When we think of balustrading for our stairs, we tend to think of wooden balusters, spindles or stair sticks as they are sometimes called. These balusters come in many different shapes and sizes and some different materials too, stone and metal being the most common. A spindle by any other name! The most traditional baluster are the ones that are manufactured from wood. They can range from plain sticks through to rather ornate turned spindles, but they all have one thing in common, they all take an age to clean, sand and re-decorate! Anyone who has ever attempted to sand down and paint or varnish wooden stair spindles will know that the job is long, boring and somewhat fiddly. A short run of wooden balustrading can easily take care of an entire day of your time to do a reasonable job. Should you be paying a tradesman, the bill can be pretty steep as many will charge extra as it is such a horrible task. Although wood seems to be the most commonly chosen material for a baluster, metal has become quite popular more recently. When a wooden handrail is mixed with metal balusters, they can look quite impressive, it all depends on what look you are going for. If you are seeking a nice Gothic look to your property, hammered black metal balusters may well be the way forward, but beware, one should always consider the safety of people using the stairs. Stairs have always posed a risk to users. Falls down a flight of stairs are pretty commonplace to be honest and this is the main reason to have handrails and balustrades. The handrail gives the user something secure to hold onto as the walk up or down the flight of stairs and the balustrade is there to prevent you from falling off the edge of the stairs. Depending on the way your flight of stairs is configured, users may also use the baluster spindles to steady themselves too. Often the metal balusters will have all manner of patterns that one can easily catch a finger in. Children in particular tend to swing on anything they can get their hands on, and the last thing you want is your childs finger being broken or dislocated, when it becomes trapped in a metal baluster. Another major problem with baluster spindles of either material is the spacing. We have visited clients on many occasions to replace their old balusters with our glass balustrades, only to be told that their childs head had become trapped between the old spindles. As well as swinging on things, children have an uncanny ability of sticking their heads through the smallest of gaps. Not only is this frightening for the trapped child, it can potentially be lethal by cutting off their airways as they struggle to free themselves. Clearly there are recommended distances for spindles of any kind to be placed and if these guidelines are followed, a head entrapment could be avoided. However, arms and legs can still easily fit in between the balusters, presenting a potential danger zone in your property for people using the stairs. On top of the entrapment danger, wood has a nasty habit of being easily damaged. A sturdy knock with a vacuum cleaner, or even if something falls against it, chips and sharp splinters can be the end result. The last thing you want when walking up or down your stairs is to be impaled with a jagged piece of wood. Toughened glass balustrades: Beautiful versatile and safe! 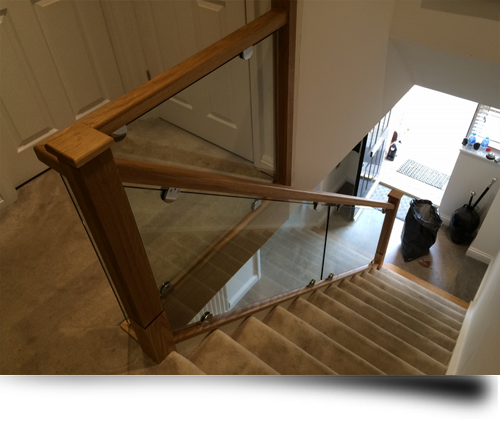 The great thing about our toughened glass balusters is that they avoid all of the negative points that wooden balustrades have. Because the glass is toughened, you can rest assured it will withstand some pretty hard knocks and come off better than its wooden cousin. If the thought of a clear glass balustrade would make you feel uneasy walking down the stairs, you can always opt for a sandblasted or textured finish. The real beauty of having your balustrades made from toughened glass is that the designs available to you is simply vast. You really are not restricted to panel after panel of toughened glass. All tastes can be catered for with a toughened glass balustrade. If you think that glass balustrades are only for the stairs, think again! Picture the usual balusters and handrails that surround you garden decking. Can you magine how fantastic these would look in a sparkling glass finish? Coupled with wooden posts and handrails or metal, the design possibilities are virtually endless. Toughened glass balustrades also look amazing as a surround for a gaden pond or swimming pool. The glass is always so easy to keep clean, no matter what the season.